FOX 440C stainless steel balls are the whole package. These grinding media balls are everything you love about chrome steel balls, with one very important advantage. 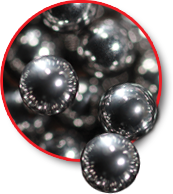 Stainless Steel Balls have been engineered and designed with advanced steel properties, which give them excellent corrosion resistance. It doesn’t matter if it’s fresh water, steam, crude oil, gasoline, blood, perspiration, alcohol, foodstuffs or sterilizing solutions in your ball mills, a FOX Stainless Steel sphere is resistant to it all. This resistance to corrosion comes in particularly handy when you’re doing ball milling in a wet milling environment or an environment that has very high pH level. These slurries are sometimes comprised of very acidic or high alkaline mixtures that may react with certain metals. This is where grinding with stainless steel beads comes into play. These steel balls are worthy of your ball mill operation. FOX Stainless Steel grinding balls are Martensitic and can be through hardened to 60 HRC. They’re magnetic, too—which offers advantages in certain applications. All in all, these grinding media balls are ideal for use in applications, where corrosion resistance is required. FOX 440C Stainless Steel Balls. Incredible performance. Incredible results.